Why Sculptra Is the Perfect Anti-Aging Solution - Doctor Hermann M.D.,P.A. We live in a society where youth is one of the most highly valued assets. Unfortunately, it’s also one of the most difficult to protect. You don’t want to look older than your true age, but the cumulative effects of the sun, stress, environmental toxins, and lost collagen damage your skin. Thankfully, we have access to simple and safe dermal fillers that can reverse your most unwanted signs of aging and rejuvenate your appearance. Sculptra in particular is the perfect anti-aging solution. 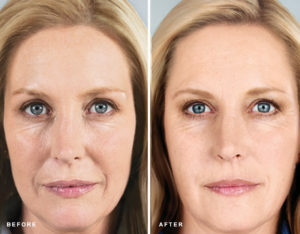 Sculptra is a liquid solution injected into the face, just like Juvederm, Radiesse, and other fillers. But rather than providing immediate results that may not look entirely natural, Sculptra works by gradually and subtly adding volume to the face to eliminate signs of aging. It is a long lasting solution rather than an overnight miracle. This one-of-a-kind anti-aging technique works over time to develop the extra volume needed in the face to restore lost cheek volume, soften harsh cheekbones, contour the jawline, and fill in deep folds that run from the nose to the mouth. How Does Sculptra Fight Signs of Aging? Sculptra’s main ingredient, poly-L-lactic acid (PLLA), works with the body to rebuild lost collagen. Collagen is crucial to the health and appearance of your skin, so the more collagen your skin produces, the firmer it looks and feels. Sculptra helps the skin produce more collagen so that it is able to maintain firmer structure. Unlike other dermal fillers, Sculptra is applied to the skin in three or four treatments over the span of a few months. This gradual introduction of PLLA into the skin stimulates noticeable volume for results that last long beyond two years. Sculptra differentiates itself by offering results that truly last. It is an excellent anti-aging solution that works infinitely better than collagen creams, collagen supplements, and other inefficient techniques. Dr. Hermann at Hermann Wellness is a master injector who can work with you to identify the signs of aging on your face that you would like to soften or eliminate. With Dr. Hermann’s help, you can receive a customized Sculptra treatment that will help you look and feel younger over the years, not older. Call today in Tampa at (813) 902-9559, or in St. Petersburg at (727) 278-3992 to schedule your first appointment and wipe years from your appearance.